The world doesn't really need another post about Mr. ZIP (aka Zippy), but I'm going to write a short one, anyway. 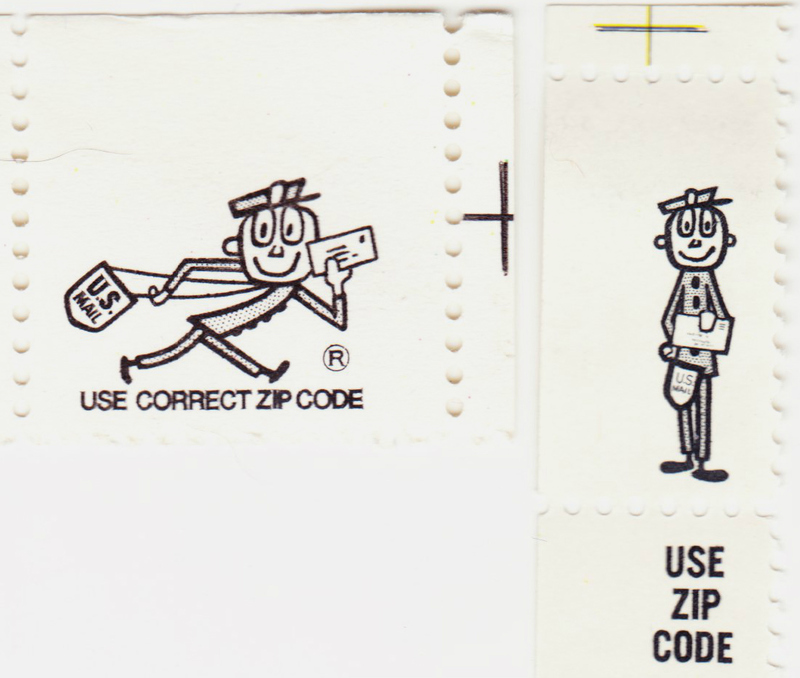 Mr. ZIP is a tiny cartoon character who hangs out on the edges of sheets of U.S. stamps. I learned that those outer areas are called selvage, and there are realms of philately devoted to this selvage. Some selvage can be important and valuable. Collectors, though, have argued about whether you should keep the selvage. See, for example, this StampoRama forum and this Stamp Community forum. Sometimes, though, the selvage can be fun, which makes it much more interesting to collect and document. That's Mr. ZIP. Pictured above are two examples of Mr. ZIP that I came across this summer and set aside. It wasn't the first time I encountered him on a sheet, just the first time he didn't go into the trash after I used the stamps. So who is Mr. ZIP? He's a United States Post Office cartoon character, designed by Howard Wilcox and later tweaked by Joe Lawrence, who appeared on selvage from 1964 until 1986 to promote the importance of using ZIP codes to help with the speedy delivery of U.S. mail. Mohawk: "Abby Curtin takes a fresh look at the many charms of Mr. Zip"
And, as you might imagine, there is a bevy of Mr. ZIP items available on eBay. It goes way beyond the selvage collections. 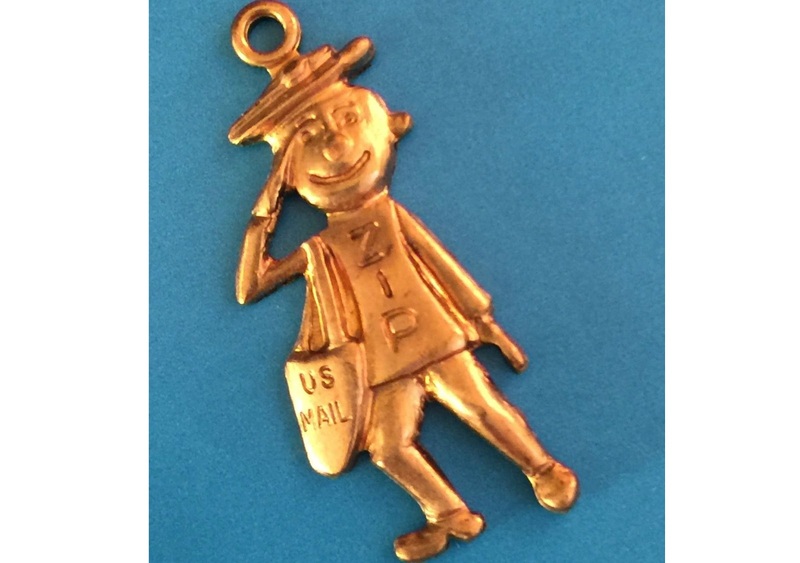 For example, who doesn't need an authentic Mr. ZIP brass charm in their life? This subject (and the word selvage) were heretofore unknown to me. So thank you - I learned something new today! I should put it in my learning journal! You didn't mention how Zippy got his name: "ZIP" = "Zone Improvement Plan". Maime says: "Look for me at church"